A statue of Irish rock and blues legend Rory Gallagher is to be put up at Belfast's Ulster Hall. Belfast City Council's planning committee gave the proposal the go-ahead at a meeting on Tuesday night. The statue will be put up on Bedford Street at the side of the hall, where Gallagher played regularly throughout the Troubles in Northern Ireland. It was at a time when many other musicians and bands chose to stay away. The proposal for the statue was made to the council by the Wilgar Community Forum in east Belfast. The decision will now go before the full council for approval. Gallagher was born in Ballyshannon, Donegal and spent part of his childhood in Londonderry before moving to Cork and making headlines with his band Taste in the late 1960s. His brother, Dónal Gallagher, said he was "ecstatic" with news about the Belfast statue. "[Belfast] was a musical home for him, it was where he left Cork for. "He had been to London, toured all over Europe but he was looking for a place where he felt he was at one with the music and Belfast offered that." 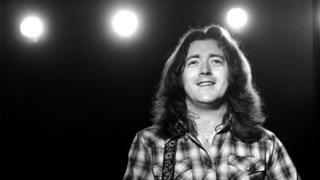 Rory Gallagher died in June 1995 at the age of 47. In 2007, a memorial plaque to the guitarist was unveiled at the Ulster Hall during a special tribute concert.